Since weight loss is a combination of burning enough calories and eating fewer calories to create a deficit, if you're trying to drop pounds, chances are you don't exactly love the fact that you want to eat all the calories in your fridge when you've spent the last 45 minutes burning just a fraction of that. So what exactly makes you hungry after you work out, and how can you change your habits? It could be the type of workout you're doing. Studies have shown that the more intensely you exercise, the less ghrelin (the "hunger hormone") your body produces, so a long, low-intensity session could be the reason why you're ravenous. But other research in women shows that even those who exercise intensely eat more calories after exercise than those who don't work out, so this isn't the only appetite-inducing culprit. If you've just finished an intense session and still feel like downing an entire pizza, it could be dehydration. Many times our bodies mistake thirst for hunger, so if you're not adequately hydrated during a workout, you may feel superhungry afterward. 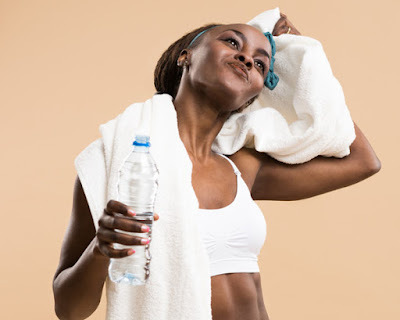 Drink enough water before and during your workout.